Top beachfront unit at Fisherman's Cove!! Fisherman's Cove is a very rare Siesta Key condo where every unit has direct, unobstructed, full Gulf views. 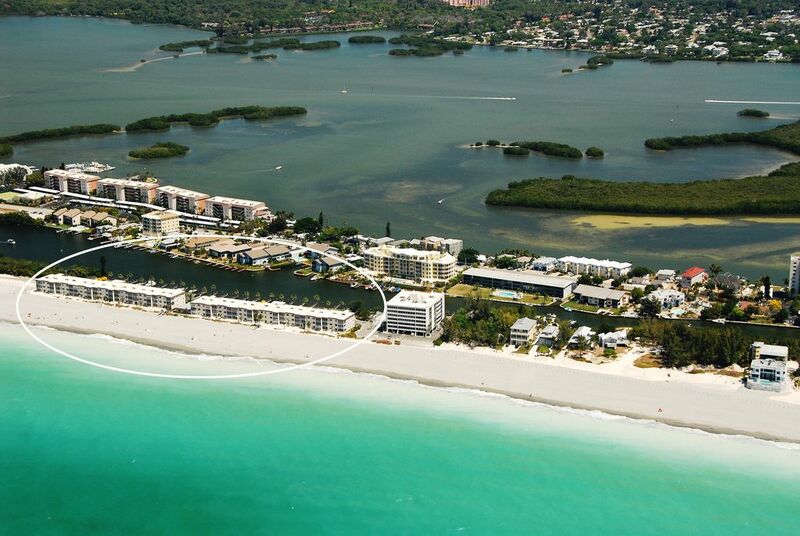 The building is one of the closest condos to the Gulf on all of Siesta Key. You could throw a tennis ball into the gulf from this Siesta Key beachfront condo! Located at Turtle Beach on the island of Siesta Key off Sarasota, Florida, this vacation home has the best of both worlds - the beach in front and boat docks with access to the Intracoastal Waterway in back. Fisherman's Cove is practically surrounded by water! While not as powdery white as Crescent (Siesta) Beach, it is less crowded and great for collecting shells. This spectacular unit is on the third floor, accessible using the elevator or outside stairwell. This unit has been thoroughly updated and professionally styled, including new furniture and furnishings. It has modern tile flooring, and completely renovated kitchen and baths, making it arguably the nicest 3-bedroom unit at Fisherman's Cove. The kitchen has granite countertops with glass tile and tumbled marble backsplash, and modern appliances including refrigerator with through the door ice/water, glass top range and oven, dishwasher and microwave. The kitchen is fully equipped including a range of small appliances. The dining area has seating for six and is located right off the kitchen. The living room is well appointed with couch and loveseat, accent chair, large flat panel HDTV and an amazing view out to the lanai and the Gulf. Both bathrooms are all new - recently completely renovated with modern glass tile walls and tile floors, serenity slider shower doors, all new fixtures, and more! The air-conditioned lanai has floor to ceiling glass windows overlooking the Gulf of Mexico and the beach below. Sleep at night with the ocean surf right outside your window! The master bedroom has a bay window overlooking the Gulf and beach below. It has a king-size bed, large HDTV, walk-in closet, and en suite bathroom with a large tiled shower. The second bedroom has a king-size bed, and the third bedroom has two twin beds. Additionally, two twin self-inflating/deflating aerobeds are provided that can be placed wherever you choose. The second and third bedrooms have flat panel HDTVs, and each have a large window overlooking the bay and boat docks. These bedrooms share a full bath with tiled shower. Thank you for leaving a review! I agree; Fisherman's Cove is a wonderful place and the Trolley makes getting around the island so easy! Beach: Umbrellas, chairs, toys, towels all here. Kitchen: everything you need for cooking your own meals. Gas grills, too. And friendly people around the pool! It is a GREAT place to stay! Thanks for the review and come back and see us! We greatly enjoyed our Fisherman’s Cove Condo unit (304A). It was on the 3rd floor with stunning views of the gulf. From the unit, you have a clear and unobstructed view from the living room and master bedroom. Unit was well maintained and included a dishwasher and washer and dryer. Thank you for leaving a review! We appreciate it! A wonderful location for a November vacation. Fully equipped and clean! Will definitely return. We look forward to having you stay with us again! Thank you for taking the time to leave a review. So many extras make this place wonderful! Cannot say enough good things! We had everything we needed for a week stay. Only had to buy paper goods and food. Having the key code on the door made all the difference with three couples coming and going. The pool was also magnificently maintained. We will be back! Thank you so much. Music to my ears! Please come back! We loved our stay at Fisherman's Cove. The condo had beautiful views and most everything we needed for an enjoyable stay. The kitchen has great updates, but is missing some staple items if you plan to cook for a large group like we did. Location is great, its quiet and laid back. We enjoyed the lagoon behind us as well as the gulf. We would recommend to anyone looking for a vacation away from the commercial busy beach atmosphere. Relaxing escape! Thank you for leaving a review! If you stay with us again just let me know what you need, I'll have it dropped off! Located in a highly desirable location - right on Turtle Beach on Siesta Key!. Activities (on site or nearby): biking, golf, tennis, basketball, fitness center, shuffleboard, horseshoes, miniature golf, amusement parks, fishing, wildlife viewing, shopping, restaurants, live theater, cinemas, museums, sightseeing, swimming, snorkeling/diving, boating, sailing, water skiing, surfing, windsurfing, parasailing, jet skiing, shelling.